Filming for Cynthia & Mike’s wedding day began for our videographers and cinematographers just a stone’s throw away from our humble Toronto offices just north of us in the quiet suburbs of Markham, in Cynthia & Mike’s homes respectively, as the ever-eager bride and groom prepare for the long day ahead. A common thread for Chinese weddings, and a favorite to film for our videographers and cinematographers, are the door games and tea ceremony. In our highlight reel, we chose to include a quick sequence of all the fun scenes from Cynthia & Mike’s door ceremonies alongside their closest friends, bridesmaids and groomsmen alike. Sneaking in as well, to complement the morning’s high note, we include a romantic kiss between Cynthia & Mike; a lovely candid scene captured as a perfect moment to start off the day. Next, as we had chosen a quick sequence of scenes for the door games to highlight the eclectic energy during the morning ceremonies in a traditional Chinese wedding, we had also chosen to feature the many scenes of Cynthia & Mike’s tea ceremony in quick succession. More solemn and subdued than the door games before it, the traditional tea ceremony filmed shows Cynthia & Mike welcoming their most esteemed guests, family and friends, on their special day together. A nice choice for a transition scene, our videographers and cinematographers had trailed the bride and groom along with their entourage as they made their walk through the streets of downtown Toronto on their way to a venerable “shangri-la” in Toronto’s concrete jungle; to Toronto’s Shangri-La Hotel for both ceremony and celebration. Having filmed at this locale only a handful of times before, our videographers and cinematographers couldn’t help but admire such a perfect choice for an urban-themed wedding setting, in a beautiful modern building situated at the crossroads of Toronto’s discovery and financial districts. For the ceremony, Cynthia & Mike’s wedding aisle was gorgeously decorated with brilliant red and gold flower petals, staying true to the colour theme prevalent in Chinese weddings. And building up to the moment of truth with the bride’s slow walk down the aisle, we featured in the highlight the couple’s teary-eyed vow exchange, complete with a full spectra of emotions building up a lifetime’s memory unfolding right before our cameras. And with a brilliant first kiss as husband and wife, Cynthia & Mike triumphantly walked back down the aisle to a wedding night’s celebration and a new life ahead. A lovely scene, and a favorite of our videographers and cinematographers, was the couple’s cake-cutting and first taste. Cynthia & Mike had a rather unique and very cute cake for their reception, a Winnie-the-pooh themed cake to bring a little piece of Disney magic to an already magical day. And as we had highlighted the early morning’s scenes in a succession of candidly captured memories, we too feature the reception’s lively energy by highlighting the most emotional and memorable parts of what was a truly memorable evening. 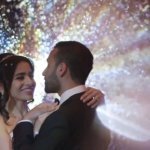 From the couple’s magical first dance, to a toast all around for the newlyweds’ newfound path, to a cute bouquet toss and an open dance floor that only filled with liveliness as the night grew long. And through it all, every bright smile captured twice-fold with our photo-booth running through Polaroid films of precious memories throughout the evening. Thus, all in all, we here at SDE Weddings, Toronto’s premier wedding videography, cinematography and photo-booth rental group, can’t help but smile as well when looking back at how perfect Cynthia & Mike’s wedding day had went. We wish the newlyweds the very best together, and we hope that our work may always bring a smile to their faces throughout their lives. Wedding venue: Shangri-La Hotel | 188 University Ave.